This article is about the travel class. For other uses, see Business Class (disambiguation). Business class is a travel class available on many commercial airlines and rail lines, known by brand names which vary, by airline or rail company. In the airline industry, it was originally intended as an intermediate level of service between economy class and first class, but many airlines now offer business class as the highest level of service, having eliminated first class seating. Business class is distinguished from other travel classes by the quality of seating, food, drinks, ground service and other amenities. In commercial aviation, full business class is usually denoted 'J' or 'C' with schedule flexibility, but can be many other letters depending on circumstances. Airlines began separating full-fare and discounted economy class passengers in the late 1970s. In 1976, KLM introduced a Full Fare Facilities (FFF) service for its full fare economy class passengers, which allowed them to sit at the front of the economy cabin immediately behind first class, and this concept was quickly copied by several other airlines including Air Canada. Both United Airlines and Trans World Airlines experimented with a similar three-class concept in 1978, but abandoned it due to negative reactions from discount economy class travelers who felt that amenities were being taken away from them. United also cited the difficulty of tracking which passengers should be seated in which section of the economy cabin on connecting flights. American Airlines also began separating full-fare economy passengers from discounted economy passengers in 1978, and offered open middle seats for full-fare passengers. Around this time, there was speculation in the airline industry that supersonic aircraft would corner the market for the highest-paying premium passengers, and that a three-class market would emerge consisting of supersonic first class and subsonic business and economy classes. In 1977, El Al announced plans to reconfigure its aircraft with a small first class cabin and larger business class cabin on the assumption that most transatlantic first-class passengers would shift their business to the Concorde. British Airways introduced "Club Class," a separate premium cabin with numerous amenities, in October 1978 under CEO Colin Marshall as a means of further distinguishing full-fare business travelers from tourists flying on discounted fares. Pan Am announced that it would introduce "Clipper Class" in July 1978, and both Air France and Pan Am introduced business class in November 1978. Qantas claims to have launched the world's first Business Class in 1979. On November 1, 1981, Scandinavian Airlines System introduced EuroClass with a separate cabin, dedicated check-in counters and lounges for full-fare passengers. Simultaneously, first class disappeared from their European fleet. Both Qantas and Virgin Australia offer business class on their domestic networks as well as on trans-Tasman flights to New Zealand. Flights between Perth and Sydney typically feature lie-flat seats, with deep recline cradle seats on other routes. On the other hand, Air New Zealand does not offer business class on its domestic network. Business Class is available on flights between New Zealand, Australia and the Pacific Islands when operated by Boeing 777 and Boeing 787 family aircraft, both of which have lie-flat seats. 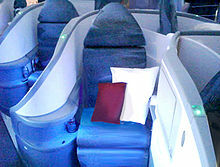 On short-haul flights, Air Canada, the flag carrier of Canada offers recliner seats, which are similar to what is offered on regional business class in the United States. However, on some high-capacity routes, such as Vancouver-Toronto, Air Canada utilizes its long-haul fleet, such as the Boeing 777, Boeing 787, Boeing 767, and the Airbus A330. On flights using Internationally configured aircraft such as these, the business class product is a lie-flat product. However, on discount carriers, such as Air Transat, and WestJet Airlines, business class is "euro-style", an economy class seat with a blocked middle seat for added comfort. US carriers generally designate "first class" as the front cabin on domestic aircraft, including two-class aircraft. Three-class service is offered within the United States by American Airlines and United Airlines. American operates a dedicated fleet of three-class aircraft on transcontinental flights between New York-JFK, Los Angeles, and San Francisco, with first and business class seating comparable to international first and business class. United operates three-class aircraft between its hub airports for re-positioning purposes between international flights. United, Delta and JetBlue also offer two-cabin transcontinental flights using seats equivalent to international business class seats. European carriers generally offer a business class consisting of enhanced economy seating with better service. There may be a curtain to separate business from economy class, based on demand, but the seats are in the same cabin. Some airlines such as Air France and Lufthansa use convertible seats that seat three people across in economy, or adjust with a lever to become two seats with a half seat length between them for business class use. Business class has started to disappear from some short/medium haul routes, to be replaced with full fare economy and discount economy (KLM and SAS). On these routes, the seats are the same for all passengers, only the flexibility of the ticket and the food and beverage service differs. On shorter routes (typically less than one hour) many airlines have removed business class entirely (e.g. BMI on many routes) and offer only one class of service. British Airways used to offer "Business UK" on their domestic system, offering the same service as economy class, with the addition of expedited check-in, baggage reclaim, lounge access and priority boarding. In flight, until January 11, 2017, drink, tea or coffee and a snack were served to all customers, with a hot breakfast on flights prior to 9.29am. AirAsia charges a premium for passengers to sit in front of the aircraft or the exit seats which also offer more legroom as well as board first (these are called Hot Seats). On their domestic and trans-Tasman networks, Air New Zealand has Space + seats available complimentary for Koru Club elite members and for a small charge at check-in for others. Other than a few more inches of legroom the seats are identical to normal economy seats. JetBlue offers Even More Space (the first 9 rows on the A320 and the bulkhead and emergency row on the E-190) for between $20 and $90 extra per segment. EML includes priority boarding and priority security screening but no other benefits. Spirit Airlines has Big Front Seats in the first row of all their aircraft. The seats were part of Spirit's former First Class offering, Spirit Plus, but now offer no benefits other than bigger seat pitch and a 2 by 2, rather than 3 by 3 arrangement. Business class is a much more significant upgrade from economy class for long haul flights, in contrast to a regional or domestic flight where business class offers few relative advantages over economy class. The innovations in business class seating, incorporating features previously only found in first class (see below), has narrowed the comfort and amenities gap with traditional first class seats. 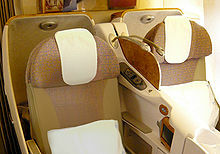 These advances and added features to business class, as well as the late 2000s recession, have caused some airlines to remove or not install first class seating in their aircraft (as first class seats are usually double the price of business class but can take up more than twice the room) which leaves business class as the most expensive seats on such planes, while other airlines have reintroduced first-class sections as suites to stay upmarket over contemporary business class. Cradle/recliner seats are seats with around 150-160 degrees of recline and substantially more leg room compared to the economy section. The seat pitch of business class seats range from 38–79.5 in (97–202 cm) (usually 55–62 in (140–160 cm)), and the seat size of business class seats range from 17.5–34 in (44–86 cm) (usually 20–22 in (51–56 cm)). Although many airlines have upgraded their long-haul business class cabins to angled lie flat or fully flat seats, cradle/recliner seats are still common in business class on shorter routes. Angled lie flat seats recline 170 degrees (or slightly less) to provide a flat sleeping surface, but are not parallel to the floor of the aircraft when reclined, making them less comfortable than a bed. Seat pitch typically ranges from 55 to 65 in (140 to 170 cm), and seat width usually varies between 18 to 23 in (46 to 58 cm). 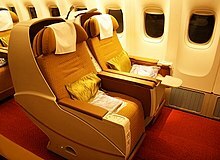 These seats first appeared on Northwest, Continental, JAL, Qantas and several other airlines in 2002 and 2003. Fully flat seats recline into a flat sleeping surface which is parallel to the floor. 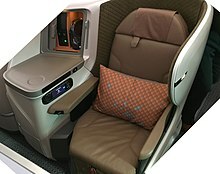 Many airlines offer such seats in international first class but retain inferior seating in business class to differentiate the two products and fares. 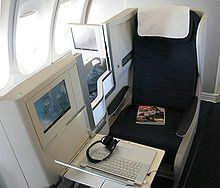 British Airways, which introduced flat beds in first class in 1995, was among the first airlines to introduce fully flat business class seats with its Club World product in 1999. Herringbone seating, in which seats are positioned at an angle to the direction of travel, is used in some widebody cabins to allow direct aisle access for each seat and to allow a large number of fully flat seats to occupy a small cabin space. The concept was first developed by Virgin Atlantic Airways for its Upper Class cabin and has since been used by Delta, Cathay Pacific, Air Canada and other airlines. Cabin seat, These seats are designed to give the business class traveler the most privacy they can attain while in flight. These seats are typically positioned in a 1 - 2 - 1 arrangement on a wide body jet. On each side of the seat is a privacy panel about four feet in height. Aircraft such as these offer the best ergonomic comfort on long haul business class flights. These were first introduced on US Airways. Recaro claims its CL6710 business seat is one of the lightest at 80 kg (176 lb) while other can be beyond 100 kg (220 lb), adding up to a 2–3 t (4,400–6,600 lb) for 60 seats. While flying on a long-haul business class flight, airlines such as Swiss, Lufthansa, SAS Scandinavian Airlines, and many more offer in-flight gourmet meals with a choice of entree. Upon settling on their seats, business class passengers are presented with a choice of champagne or water, with a 3-5 course meal to follow during the flight. Some airlines, such as Singapore Airlines, allow travelers to request specific meals not on the regular menu prior to the flight. The bar choices for the business class cabin are generous, with airlines offering different premium wines, and an assortment of beers and liqueurs. The exact name for business class may vary between operators. Bold text indicates airlines for which business class is the highest class of service offered. Adria Airways "Poslovni Razred (Business Class*)"
Aeroflot "President (long-haul)" "Президент", "Premier (short and mid-haul)" "Премьер"
Air Canada "Signature Class (formerly, International Business Class)", "Business Class (Domestic, formerly "Executive Class")"
Air New Zealand "Business Premier"
Asiana Airlines "Business Smartium" or "Business Class"
Avianca "Business Class" "Clase Ejecutiva"
Bangkok Airways "Blue Ribbon Class"
Beijing Capital Airlines "Business Class"
Biman Bangladesh Airlines "Business Class"
British Airways "Club World", "Club World London City", or "Club Europe"
China Airlines "Business Class" (formerly "Dynasty Class") and "Premium Business Class"
China Eastern Airlines "Business Class"
China Express Airlines "Business Class"
China Southern Airlines "Business Class"
Etihad Airways "Pearl Business", "Business Studio"
EVA Air "Premium Laurel" and "Royal Laurel"
Hawaiian Airlines "First Class" (domestic) or "Business Class" (international), and '"Premium Business Class"
Iberia "Business Plus" and "Business Class"
Iran Air "Homa Class" "هما کلاس"
MIAT Mongolian Airlines "Business Class"
Middle East Airlines "Cedar Class"
Myanmar National Airlines "Business Class"
Norfolk Air "Bounty Class (now Premium Economy)"
Pakistan International Airlines "Business Plus+"
Qantas "International Business" and "Domestic Business"
Royal Air Maroc "Premium Class"
Royal Brunei Airlines "Business Class"
Saudia "Horizon Class" "درجة الأفق"
Scandinavian Airlines "Business Class on flights to/from Scandinavia and US/Asia, SAS PLUS within Europe"
Sky Angkor Airlines "Business Class"
SriLankan Airlines "SriLankan Business Class"
Swiss International Air Lines "SWISS Business"
TAAG Angola Airlines "Executiva Class"
TAM Airlines "Executive Class" or "Classic Class"
Thai Airways "Royal Silk Class"
Thai Lion Air "Business Class"
Virgin Atlantic Airways "Upper Class"
Virgin Australia "Domestic Business", "The Business", and "International Business"
America West Airlines "America West First"
British Caledonian Airways "Executive/Super Executive"
Malév Hungarian Airlines "SkyClub Business Class"
Mexicana de Aviación "Elite Class"
Northwest Airlines "World Business Class"
On Amtrak in the United States, "business class" is the premium class of service on medium-haul trains (such as most Northeast Corridor trains and the Pacific Surfliner), the intermediate class of service on some long-haul trains (such as the Cardinal) and the main class of service on Acela Express. "First class" is the premium class of service on Acela Express and is also the designation for sleeper service on long-haul trains. Until June 2009, Via Rail in Canada premium class service was called "Via 1", on short range routes oriented towards business travel. The premium service on the transcontinental route (The Canadian) is called "Silver & Blue". In June 2009, "Via 1" was renamed "Business Class" and "Silver & Blue" (The Canadian) and "Easterly" (The Ocean) were renamed "Sleeper Touring Class" and "Totem" (The Skeena) was renamed "Touring Class". Eurostar also offers business class accommodation on their rail services. ^ Perry Garfinkel (2008-03-10). "On some airlines, business class goes first". The International Herald Tribune. Retrieved 2015-12-15. ^ "UN TRAVEL POLICY SUMMARY" United Nations Environment Programme. Retrieved: 20 September 2012. ^ Bennett, Andrea. "Deciphering Airline Fare Codes Archived 2012-08-29 at the Wayback Machine" Airfare Watchdog, 21 October 2008. Retrieved: 20 September 2012. ^ a b "Why airlines are wooing the business high-fliers". news.google.com. ^ "'Three-class' air service is scrubbed by TWA". news.google.com. ^ "'FULL-FARE' Passengers to Get Better Service on Airliners". news.google.com. Archived from the original on 2016-07-07. Retrieved 2018-11-26. ^ Williams, Winston (1977-08-18). "El Al Sees Financial Drain Resulting From Fare Cuts – El Al Expecting Reduced Fares To Cause Severe Financial Drain – Article – NYTimes.com". Select.nytimes.com. Archived from the original on 2012-11-06. Retrieved 2012-03-29. ^ "Pan Am Profit Hit High in 2nd Quarter; Revenue Rose 16%". Pqasb.pqarchiver.com. 1978-07-27. Archived from the original on 2012-11-06. Retrieved 2012-03-29. ^ "air france | 1983 | 1806 | Flight Archive". Flightglobal.com. 1983-10-01. Archived from the original on 2012-01-30. Retrieved 2012-03-29. ^ "Boeing Aircraft Take Qantas Further". Qantas.com.au. Archived from the original on 2013-01-13. Retrieved 2012-03-29. ^ a b "Comparing Premium Transcontinental Service Across Carriers". The Points Guy. Archived from the original on 2017-12-01. Retrieved 2017-11-28. ^ Snyder, Brett. "United Makes New First and Business Class Confusing—We Make It Clear". Condé Nast Traveler. Retrieved 2017-11-28. ^ "AskAirAsia - What is a Hot Seat?". www.airasia.com. Archived from the original on 2017-06-01. Retrieved 2017-05-17. ^ Woodyard, Chris (2003-08-05). "More airlines to offer seat-beds". Usatoday.com. Retrieved 2012-03-29. ^ Tom McGhie (1999-05-26). "Losing economy seats to launch club class 'flying bed' revolution may not add up". London: Guardian. Archived from the original on 2014-05-07. Retrieved 2012-03-29. ^ "Airlines in the hot seat over Virgin's Upper Class patents". Business.timesonline.co.uk. Retrieved 2012-03-29. ^ Peter Rusanoff. "US Airways Business Class Around The World". waytofly.com. Archived from the original on 2015-04-04. Retrieved 2013-09-26. ^ Kerry Reals (Jan 3, 2018). "Business Class Seats A Weighty Issue On Ultra Long Range Flights". Aviation Week & Space Technology. ^ Peter Rusanoff. "Business Class Review". waytofly.com. Archived from the original on 2014-06-27. Retrieved 2013-09-26.